DEATHLING OF DORN by John Timmis. Matador Books, £8.99, 361 pp. Sword and sorcery is still a very popular sub-genre of fantastic literature, especially with the success of Game of Thrones. This book is very much a fantasy in the traditional style. Unfortunately, it doesn’t have a slickness of story-telling as found in the novels of Terry Brooks or Maggie Furey. The problem is that the writing style is old-fashioned and ponderous with a tendency to tell the reader what is happening rather than showing it in action and dialogue. Having said that, though, it does have a presence in common with the works of Charles Dickens. He was well known for touring theatres and performing his works to packed audiences. The Deathling of Dorn would probably come across well if performed by a polished actor such as Reggie Oliver. The problems with this book probably stem from the fact that – according to the publisher’s website – it was written over forty-five years ago. A lot can happen in that time. Not only do the accepted and desired styles of writing change, so do people. Those who continue to write, even without publishing success, hone their skills. Timmis hasn’t given himself the chance to do this. A novel, to keep the attention of the reader needs to grab then from the start. This doesn’t do this and the text is full of information that rightly should either have been left as part of the authors notes or fed to the reader gradually by other means. The result here, is pages with very little dialogue, as characters initially spend too much time on their own, and when it does occur is as long, unnatural lectures. Not only is the dialogue, when it is present, a problem as all the characters speak the same way. There is no differentiation between speech patterns of the rough soldier and the Queen of Gullen. The result is that there is no depth to the characters, they tend to be either good or evil, we don’t get to know them and can’t really care about what happens to them. This is compounded by the frequent and unnecessary changes of point of view. There are a number of familiar tropes within the plot and some readers would welcome this. Endworld is under threat. The Gods have faded away but there is magic. Venain is the evil wizard who has no saving graces and only wants to conquer the world. Virdil is the good wizard who is foolish enough to go up against Venain without proper preparation. He is killed but is lucky in that his soul finds an empty vessel to enter. Venain had captured a random woodsman, Lindarg, from the Forest Of Dorn and taken his soul in order to give himself immortality. Lindarg’s empty shell is discarded in time for Virdil’s soul to take up residence. Since Venian had missing information from the spell he used, he is unaware that he is setting up the failure of his ambitions by throwing Lindarg, now a Deathling, out. As positive aspect of the plotting is that Virdil doesn’t suddenly come into possession of a new body with all its memories intact. The combination of Lindarg’s body and Virdil’s soul is almost a zombie for a time as it has no memories and just a compunction to travel north. The city of Gullen is under threat not just from Venian but also from a race called Baeths. These are marauders. It’s not made clear the true nature of their power structure and it is a long time before a general is introduced. Nevertheless, their main purpose seems to be to kill and enslave. Although Lindarg is framed as the hero in this tale, he doesn’t so much lead as wander off into fortuitous encounters followed by a group of men who have pledged allegiance to him. Fantasy readers, it would have been better to take it apart before thinking of publishing it, expanded it into a trilogy – there is a lot of telling rather than showing – and done something about the punctuation. The 21year-old Timmis didn’t know how to punctuate (two colons and two semicolons in one sentence). Hopefully, the older person does. The main magical items in the book are gemstones so it is curious that the cover illustrates a sword hilt. 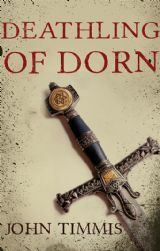 It is a good cover but I did wonder why the sword was decorated with two Stars of David and the artist isn’t credited. He deserves to be. I really enjoyed this book, had to keep turning the pages, excellent, not my usual type of book either. Thank you for a really good read, looking forward to the next book by John Timmis.